Chronological reading is helpful for an easy understanding of the New Covenant and a good way to remember details especially during Bible studies. For some, it could be annoying to read the New Covenant this way, but surely, it is very rewarding to do it. Making it your way of daily reading could take a while. Instead of following the order of letters in the New Covenant as they have been organized, it is better to read it chronologically following the dates they were written for you to have a better understanding and grip of the whole context and the whole canon of the New Covenant. In this way, the time frame of each event in the New Covenant will sink in easier into your mind. Also, this will give life and sense to your reading of the texts. 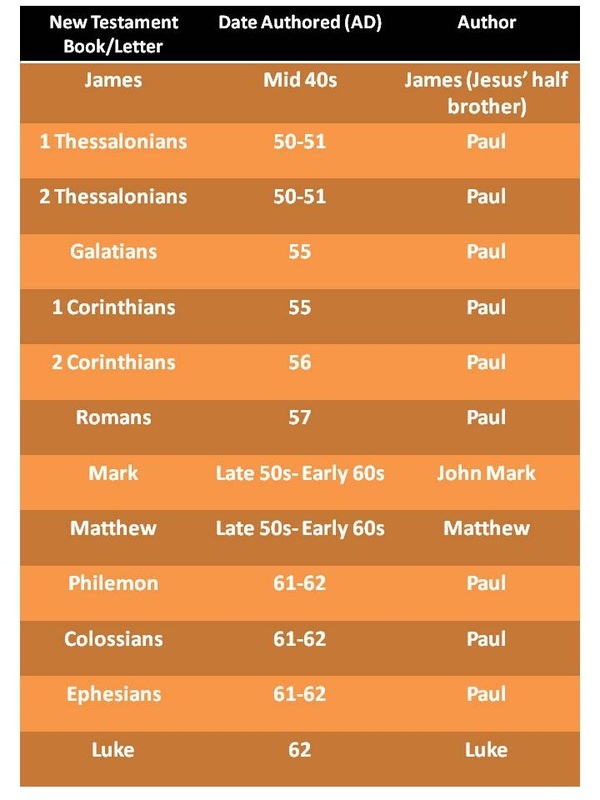 The following table shows the chronological order of the letters in the New Covenant. It contains the approximate dates the letters were written along with their authors. I, myself, noticed that by reading the New Covenant chronologically, I became more aware not just with the dates but more importantly with the thread of events and didactics (teaching). When you read the New Covenant chronologically, you'll know that the book of James is the first book written in the New Covenant. The book of Romans is written later.This knowledge is helpful especially when people cross examine you regarding the letters of James and Romans saying that James was adding to the book of Romans regarding faith and work. These people think that James was written later, but chronologically, it is the opposite. Such people are mislead by not knowing the dates the letters were written. The book of James was written first (45 AD), and the book of Romans later (57-59 AD). James was concerned about the outside fruit which is produced by faith. Fruits are outside manifestation of the inner faith of the believer. Later, the book of Romans confirmed it by saying, "we are justified (by faith without work)" in Romans 5:1. If the book of James was teaching faith and work to be saved, you would think the book of Romans would correct it, but Paul understood and agreed with James and confirmed it..."by faith alone." Another thing to consider when reading the Bible chronologically is the difference between Jewish days and Christian days. Unlike most of us who use the western calendar, the Jews use a lunisolar calendar. Their day begins on the evening (6:00 PM) and ends the following evening (6:00PM). So, their day actually starts at night: night first before the day. On the other hand, our day begins right after midnight and ends on midnight (12:00:01 to 12:00:00). For us, day first before night. Many new groups out there claim that the first day of the week wasn't the day of The Lord to break bread by pointing out that the Bread and the Cup was done on Saturday evening (our calendar). However, they forgot that the Jewish calendar is different from ours. Yes, the Bread and the Cup was done on Saturday evening but it was actually the morning of the first day of the week to the Jews. Remember, their day starts on the evening (6:00 PM). So, the Bread and the Cup was taken on the morning of the first day of the week. Hence, it is only proper to do the same--breaking the bread on the morning of the first day of the week. To understand more the Jewish days and calendar system, click HERE.